Posted by sunflower71 in Life with 3 princesses, my opinions, The Star. This is probably for many of us in this role one of the issues that troubles us most. Unlike other skills we might possess there is pretty little to show us if we are actually on the right track or not. I do not mean to say that the difference between parents is not sometimes too obvious for the wrong reasons but that there are no indicators that could in some way let us know that we are actually on the right path to helping out children become mature and responsible adults….that is, until they are older and have become adults. But then, by that time, it is obviously too late to do anything about it anyway. Then today, while I’m taking down the clothes from the clothes’ horse The Star comes along to help out. She starts piling up the clothes according to who they belong to and then putting the pegs in their container. Later when this is done, she starts giving me the wet clothes to hang together with 2 pegs at a time! We work silently together until both tasks are complete. For the record, she is 2 years 4 months old. Now, tell me, if this is not a sign that I’m doing something right with the girls, what is? Posted by sunflower71 in about me, Life with 3 princesses. I first came across this piece of wisdom in this book. I love Nigella’s way of writing. She makes everything seem really easy and takes the cook’s approach to cooking instead of the chef’s. I first came across her books when I poached a gift my chef brother had been given – How to Eat. Back to Nigella Christmas. 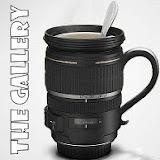 For the big day she is first photographed carrying this mug (there I go again with mugs). Here it is…. Encouraging, is it not? The history of this motto dates to WW II. It was meant to be ‘splashed’ all over Britain had Germany succeeded to invade it. Since this did not, in fact, take place, the original posters were never used. At least one survived and was discovered earlier this decade. Back to me…it has lately become my mantra. I repeat it to myself often especially during the long hot afternoons when I feel only like lying down and dozing off but have to remain alert, entertaining and responsive to my 3 princesses. For now it’s working… I hope it’s magic doesn’t fade. With the kids on half days….I’m at the school gate again at 1145…. and the heat, my time has really disappeared. In a couple of weeks it will be even worse when school will be officially over on June 28th. Many things are happening, and I’m also finally started to document these with photos but the time to actually blog about them just isn’t there. I’m definitely in need to time reorganisation and maybe a few energy boosting drinks to get me through the day in a better shape. Any ideas? Posted by sunflower71 in Life with 3 princesses, The Gallery. This weeks’ prompt on Sticky Fingers is Still Life. Well, I thought hard and long because my photographic skills are very limited but in the end I decided to link together 4 elements that I have written about earlier or at least meant to. Put together like this, it looks like I’m going to have a few minutes to myself. 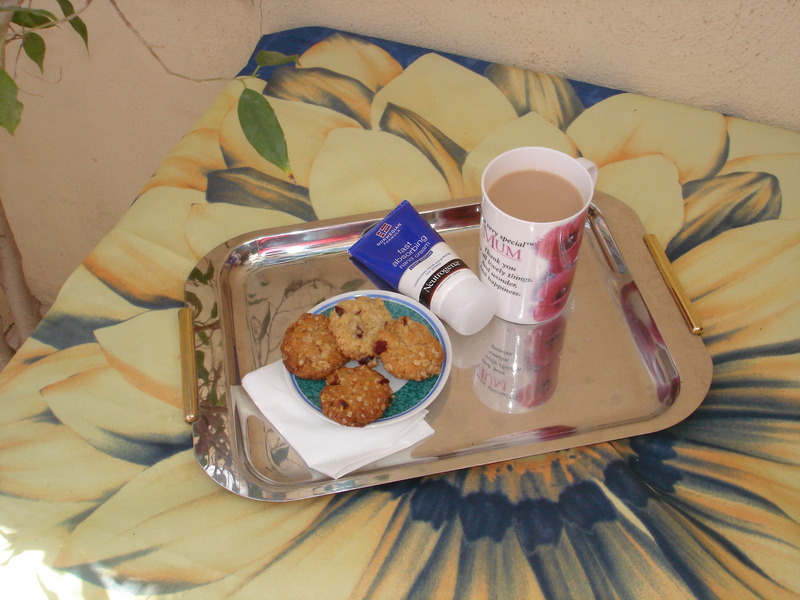 I’d start with applying a generous coat of hand cream (the best for someone who like me gets very chapped and dry skin is Neutrogena), then I’d munch my way through the cookies (these are Anzac biscuits revisited – I add chopped cranberries to the mix and some vanilla essence) sipping my tea (in my favourite mug that TP got me for birthday last year) as I go. I’d be having this on our terrace (here, more often than not it’s hardly ever prohibitively cold) at my little table covered with my favourite tablecloth (that I got at Castel Gandolfo, near Rome in July 2000). Now, please, don’t start thinking, that I do this every day, or every other day, or every week …. I hardly ever get to drink my tea warm enough for it to be a pleasure, but if I had to imagine a simple way to have a break – this would be it. Posted by sunflower71 in Life with 3 princesses. This must be the one, single, element of motherhood that I’d change if I could. My share is obviously triple that endured by moms of one child. And yes I know, I get triple the joys, kisses and hugs but honestly, I could do with a bit more sleep. On Friday I went to the premier of SATC 2. Now please don’t take this to be a non-event for me. This was the event of the year for me. I think I haven’t been on a girls night out since my hen’s party that took place 6 years ago today! I had been so very looking forward to dressing up and leaving all my brood behind me since my sister booked the tickets two weeks ago. The whole thing quite fitted with my expectations of the event. Red carpet, cocktails, a neck message, lovely giveaways. Then the film… I won’t spoil it for anyone who hasn’t seen it yet but for me it was a relaxing two hours enjoying my ‘heroines’ living their outrageous lives on screen. Later a delicious cocktail in lovely bar. An uneventful drive home….and an unexpected surprise on opening the front door. TS was still up waiting for me to get home! She was so excited on seeing me that she didn’t go to sleep until 3.30am. By that time I had cursed my night out at least a few hundred times! From my experience, every single time, I do or plan to do something ‘out of the norm’, sleepless nights become the order of the, em, night! Today was a day signed by many different and contrasting emotions. Sadness. I cried this morning. Could easily have cried my eyes out had I not gripped my self on time. Pride. I watched TC announce her class’s song during her school’s celebration concert. Amazement. At TP who sang her heart out and danced happily away with her class mates during her concert. Panic. To make sure there was going to be dinner (a healthy one) on the table in between going to my princesses’ school no less than 3 times (at 9 for TC’s concert, at 11 for TP”s one and again at 2 to pick them up – each age group is too numberous, the hall too small to hold more than two invites for each child of each age group). Happiness. At meeting up with an old friend who has since we last met moved to Ireland, and had two girls the same age as TP and TC. Wonder. At seeing my girls and my friend’s enjoying themselves dressing each other up. But it’s about my sadness that I’d like to write today. the school’s stage – about 12, 3 year olds standing up in a line next to each other facing the audience singing at the top of their voice “Wind the bobbin up”. Then to the left, next to the standing children, sit two children with a Learning Support Assistant – she is banging on a tambourine – the two children are looking everywhere and no where. I fight the first tear. I find a seat for myself at the back of the school hall. I settle down. And see next to me an older girls in what looked like a very complicated wheelchair – next to her another Learning Support Assistant writing on what look ed like a copybook. And I simply broke down. I cried with the mothers of the two children sitting on stage, whose hearts must contract every time they look at their children who are not able to stand in line with the others. I cried with shame at how enormous I see my problems when in reality they are minute in comparison. I cried with a doubt so deep that I started wondering if maybe the inclusion policy of the Education Division of this country has missed the point entirely. Why wasn’t that older girl with her class? Then I told myself that I had to stop making a show of myself and let the happy voices, poems and movements songs fill my mind. As my emotionally busy day proceeded, I repeatedly thanked God for our general good health and for giving me so much. As I do now, at its end. Posted by sunflower71 in The Star. This morning, like all mornings, I woke up with a start as TC starts her loud sounds as she awakes to ensure my man or me go to her to bring her on our bed for the last few moments of rest. TS woke with these sounds and today chose to be exceptionally loud as well. So no last few moments and off we go to start off the day. I am not a morning person. My family members with whom I grew up know this very well. Since becoming mother this trait has had to adapt itself to the needs of my off-spring though. The morning rush is a routine until at 0830 a certain calm falls on the house again in time for TS’s breakfast. But no such luck today. TS must have woken up in a bad mood or something and just couldn’t settle down. Moreover two of my 3 neighbours (we are 4 in this apartment block), the ones under us and the ones next to us had workmen in….so our background music today was tum-tum-tum-tum-tum-tum-tum. Now I know that when people take over a new place they often try to adapt it to their needs and adjust whatever is needed. We did that too when we bought ours 7 years ago but since then we (read here – me, as I’m the one who is all day here when the workmen are here) had to suffer through the apartments changing hands a couple of times. And each time, the new tenants improve (I assume) on what they buy. Now in reality I wouldn’t mind so much the tum-tum-tum if, for example, I knew what they were doing exactly. In that way I would know how long this would take. But no such luck! So my day started off on the wrong foot and till this point it seemed it was going to be a tougher one than usual until I got that lovely sms sound on my mobile that turned out not to be a promotion but my journalist friend asking to meet up. I rushed to get ready. TS was still in her loud mood and to quiten her down I handed her over my mascara after she watched me use it. In the mean time I got my things together and was ready to leave but when I return to lift TS up I find her with the wand in her mouth, her hands both very black! Apparently she knows how to unscrew something and I hadn’t realised this. I told myself not to panic, washed her as well as I could and hoped for the best. On my way to me rendez-vous she took a nap… a nap that lasted 3 hours! On waking up she looked well and rested, and calm unlike the morning so I decided I could put the mascara incident behind me. 2 lessons learnt today: TS can unscrew something. Mascara is non-toxic. Bobby now you will only get warm cuddle and tickles. You can smile and laugh as no harm will ever come your way again. I never knew you but I know about your terrible short life. You deserved better. All the children in the world do. But some of us adults seem only intent on messing up the innocence of childhood. Spare a thought or a prayer for those children suffering at the hands of adults at this moment that the abuse or whatever type it is can stop forever. I think, for me and other mothers, the most beautiful sound of all must be the rhythmic peaceful breathing of the children sleeping soundly after a busy day. It is beautiful not only for it self but for what it promises…an uninterrupted night of rest for us too. That’s my background music at the moment. We had a very hectic weekend…. I’m not sure if I prefer the regularity and predictability that the weekdays give us or the loosely planned weekends when we have more time to spend as a family. This morning, on a whim and correctly predicting that not many parents had our plans, we headed for our favourite park. There were only a handful of other children there so we could allow the princesses to run around more freely. I have to thank once more the bank that sponsored it. Watching our youngest princess The Star running around and enjoying herself falling down without hurting on the grass (in this country open areas of this kind are very rare and far between) and getting up again ready for her next sprint, I caught myself praying more business organisations feel their social conscience ticking and the need for our children to have more of this kind of spaces. There were less people than usual because during this weekend Pope Benedict XVI visited Malta where we live. This Sunday (the BBC journalist got the day wrong) morning thousands of people lined the streets from where he passed in his ‘funny car’ – The Princess’s words not mine – on his way to one of the largest open spaces on the island where he said mass. Consequently less people at the park…. hey…here we’re not that many so events of this sort have a felt effect all round. Yesterday The Princess participated in a short but beautiful event organised for children. They gathered in front of the Presidential Palace in Valletta where they sang their hearts out and finally got to sing ‘Happy Birthday’ to the Pope – belated by one day but I guess in these cases it’s the thought that counts. I had been asked to accompany her and assist as a helper with the 5000 children that were expected to attend. I’m not sure what TP will remember most from this event…. will it be the tiredness? will it be the friendship formed in those few hours? will it be the songs? will it be the ‘funny car’? will it be the disabled children present that she observed at length and asked a million questions about? will it be the Pope? will it be the German translation of Happy Birthday she learnt? Only time will tell. More touching than The Star’s off-roading, this morning I found myself wondering when the change in The Cherub took place. I chose this nick for her because this is what she looks like – let’s just say she’s a little on the chubby side… eh… at least for me this is what a Cherub looks like. Today, for the first time ever, she challenged herself to attempt the climbing frames she has always pointedly refused to try. She got half way up a very tough one and I will never forget her look of satisfaction as she looked down on me and said “Maaaaaa loooooooooook! I quickly took out my mobile and took her picture which, typically me, now I can’t transfer to the pc… But when I’ll manage I’ll attach it… promise. She didn’t go further up but came down slowly and surely and on touch down when off to the next one. Maybe my worry that she will shy away from any sort of physical activity to become one of the dreaded by very real statistics about children who prefer to play computer games to sport is unfounded. Only time will tell but we’ll do our very best to encourage her on. And because unless we keep them busy, kids start making trouble we invited my sister and her husband for tea this afternoon…. 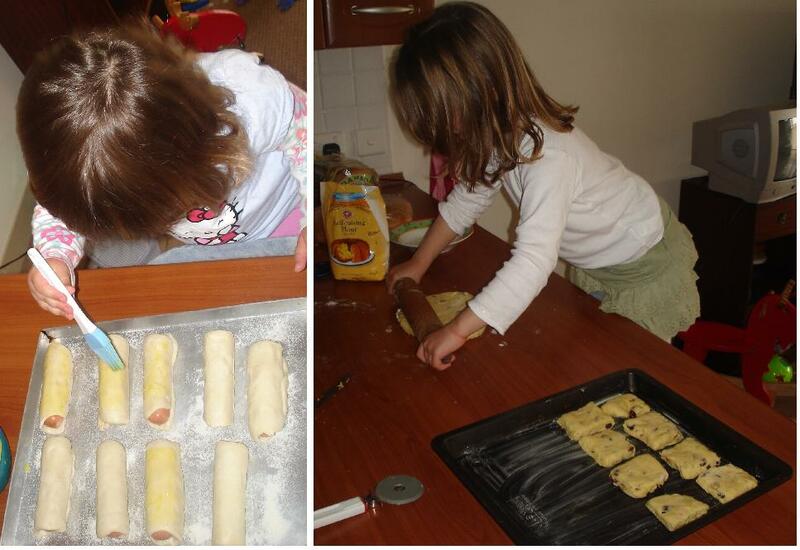 The Cherub rolled out the dough for the sausage rolls, closed them and is now brushing the pasty with beaten egg. The Princess is rolling out the dough for the scones. and prepared scones, sausage rolls, egg-mayo sandwiches, some fresh strawberries and loquats (I’m under the impression this is the English word for naspli). Now, I know, my sister will probably read this, but I do have to write this next sentence down…at least to silence my conscience that troubles me every time they leave our chaotic household. I often get the feeling that after every visit my sister, refreshes her arguments in favour of being a family of two. I pray she will never regret whatever decision they take. There is much more to share, but tonight I’ll opt for enjoying the most beautiful sound in the world (according to my father too).